1.Place chicken in large zip-top plastic bag; add ½ cup dressing. Seal bag, pressing out excess air; refrigerate at least 1 hour or up to 4 hours to marinate. 2.Meanwhile, prepare grill for direct grilling over medium heat. Remove chicken from marinade; discard marinade. Place chicken on hot grill rack; cook 10 to 12 minutes or until chicken loses its pink color throughout and reaches an internal temperature of 165°, turning once halfway through cooking. Remove chicken from grill; cover loosely with aluminum foil and let stand 10 minutes; slice. 3.In large serving bowl, toss lettuce and spinach; top with strawberries, avocados and onion. 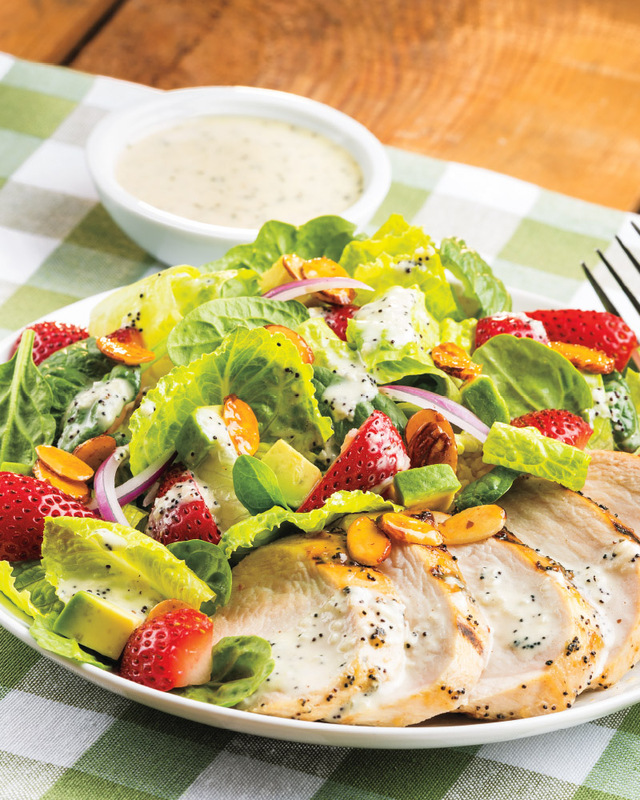 Sprinkle with almonds and top with chicken; drizzle with remaining 3/4 cup dressing. 1.In small saucepot, toast poppy seeds over medium-low heat 2 minutes or until seeds begin to pop and become fragrant, swirling pan frequently. Increase heat to medium; add onion, vinegar and sugar. Cook 10 minutes or until onion is soft. Transfer mixture to blender; add remaining ingredients and blend until smooth. Refrigerate until ready to use. Makes about 1-3/4 cups. > Chill grilled chicken, chop and toss with salad ingredients (except dressing) for a delicious make-ahead lunch.